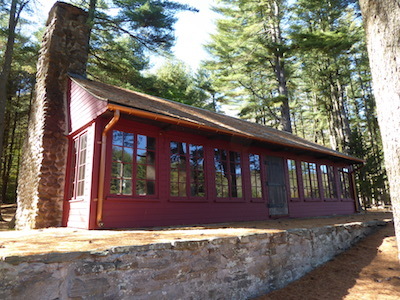 The Oak Lodge is an historic recreational building at Chatfield Hollow State Park in Killingworth, CT. 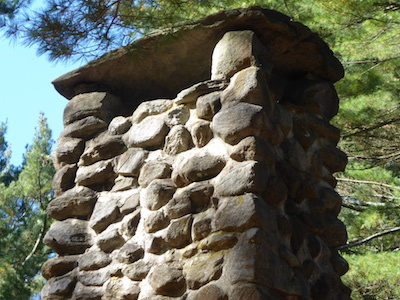 Built in 1937, it is one of the finest examples of structures built in Connecticut by crews of the Civilian Conservation Corps (CCC). 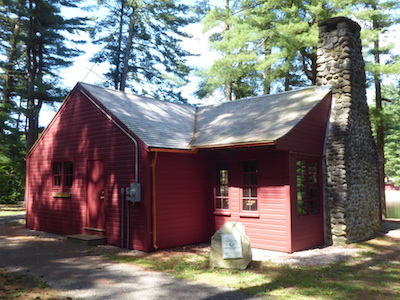 Along with Schreeder Pond, which it sits adjacent to, and other park features built by the CCC, the building was listed on the National Register of Historic Places in 1986. There were a few components to this project. 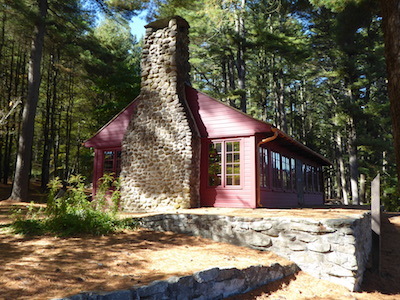 For the bellcast gabled roof, Connecticut Roofcrafters specified and replaced the wood roofing with Western Red cedar, installed copper roof flashing and repointed the fieldstone chimney. 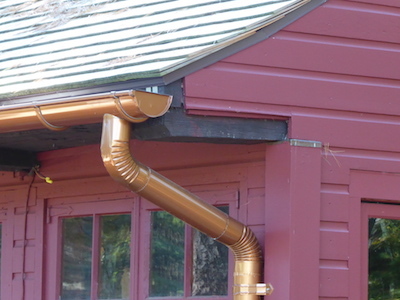 Concerns about theft kept us from using real copper for the yankee gutters so we recommended, fabricated and hung the copper-finished aluminum, which closely mirrors the original look. Roofing, repointing chimneys and fabricating gutters are all components of this project that we see week in and week out on typical roofing projects we do – although not in as picturesque a setting. Where this project got really interesting was repairing and replacing the doors and windows. We had to fabricate three doors made of reclaimed vertical boards fastened with wrought iron strap hinges. We also had to make reparations to and replace some of the multi-light wooden casement windows that line all sides of the building. We used traditional techniques to do this so they retain the look of the original doors and window from the mid-thirties. What’s more, we also reset the entire fieldstone patio and excavated for and then installed a walkway from the parking lot to a custom ramp which was compliant with the American Disabilities Act (ADA). At the end of the day, we were very satisfied with this project. Not only were we able to revisit a building which represented a historic period of construction in the United States, we got to do it in a park that is near and dear to our hearts. 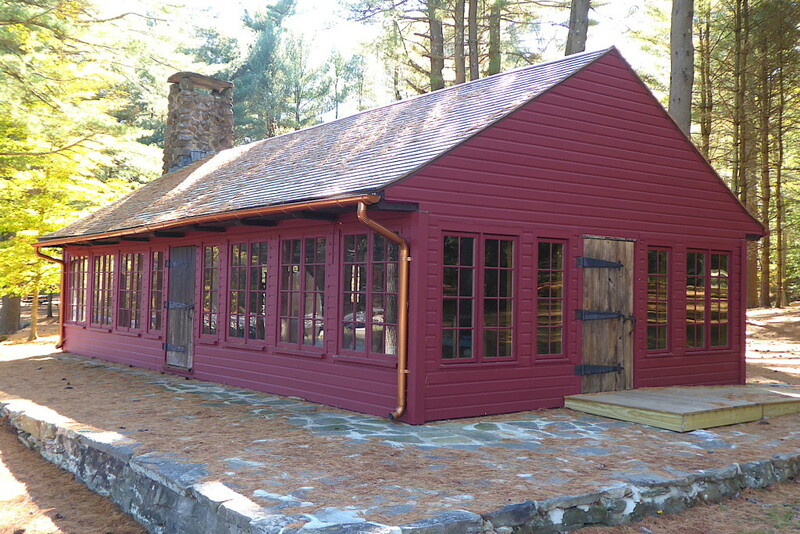 If you have a historical restoration project you are contemplating, please contact us today. This project was a bit of a homecoming for me. Having grown up in Killingworth, I spent many a day (and a few nights) admiring this building. The fact that is was more than just a roofing job also made it special. Admiring and then replicating the work of these craftsmen from decades back was a real treat.